This is a very popular pigment dyed cap and has been part of Adams line for a long time, there are some inventory issues with some of the more popular colors, so if you wish, you can always call us for an update on the inventory level before purchasing your caps online. We offer decoration services such as embroidery on this cap, so please call or email your logo in for a quote on customized Adams caps. Adam caps are excellent quality and we have never had a complaint or return due to this product. We are happy to sell the Adams brand, now owned by Whispering Pines Sportswear. 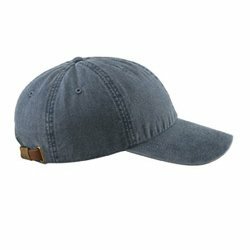 This cap is made from 100% cotton is then, Garment washed. The cap features a Tuckaway leather strap back with antique brass buckle. The front panel is Unconstructed, so there can be embroidery on the front panel. The inside of the cap has a Mesh lining and Four rows of stitching on sweatband.